Los Angeles Graffiti: $5 Tuesdays: "Act Of Valor"
While everyone was scrambling to add this year's Oscar winning movies to their Netflix queue, I went out to watch some good ol' fashioned shoot 'em up action, and let me tell you, it was satisfying. This awesome hailstorm of bullets and casings came courtesy of this week's $5 Tuesday movie: Act Of Valor, starring the brave men and women of the Navy SEALs. I've been anticipating this movie ever since I learned about it last year and I'm happy to announce that it was everything I had hoped for. If you've played the latest military videogames like Battlefield 3 or Modern Warfare 3, you're going to love this movie because it's essentially a live action version of the games. It especially feels like a videogame in certain action sequences when the camera switches to a first person perspective, letting you look straight down the sights of a fully automatic assault rifle as the soldiers clear rooms full of tangos. The beginning of the movie started out rather slowly as an unemotional voice narrated a letter that was being written in an effort to setup the nonexistent story line that would later be poorly acted out by non-actors, but all of that was quickly forgiven and forgotten as soon as the Navy SEALs got into their element, which was precisely and efficiently taking out baddies. The action sequences were intense and it was exciting to watch the SEAL team work so seamlessly with each other, moving and neutralizing targets as one organic unit. When I got home, I was inspired to play some Battlefield 3 multiplayer, but alas, the kids on the other side of the internet aren't trained killing machines and scattered like roaches at the beginning of the round. While I appreciated the technical accuracy of the movie, from the weapon sounds to the military lingo, others may not be able to follow what's happening if they're not well read on modern military tactics and jargon. But the one thing that we all can follow and that the movie made clear was when the U.S. sends its elite forces out to accomplish a mission, it gets done. 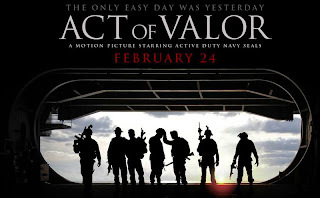 Was Act Of Valor worth $5? Absolutely. While the story didn't quite succeed in making a connection between the audience and the soldiers, it definitely took them on one hell of a ride. Watch it on the big screen or rent? If you plan on watching this movie, the only way to watch it is on the big screen. I don't know of any 7.1 surround sound home theater system that will be able to give you the proper visual and aural experience that the filmmakers intended.